2. Copy machines that malfunction every time I try to use them. 3. Paper in general. My desk is inundated. Feels like a whole dead forest lies in ruins all around me. 4. College courses that abound in busywork that reflects the professor's agenda but teach nothing. 6. Keith Olbermann. Painful to watch. The man is nuts. 8. "Mean girl" students. Give me a class of rowdy boys any day. Going out to the Shrine of the Mists now to summon some bored gods whose praise and worship teams got swallowed up by some busy god's missionaries. We will all do a dance to the futility of resistance. Welcome to "The Gods Are Bored," defending downsized deities since the dawn of the day! Mondays are tough, aren't they? Anyone know which bored deity is responsible for this despicable portion of the week? I had a busy weekend, and it was only today that I caught up with a few of my fellow bloggesses. One of them is Mrs. B, the Pagan Soccer Mom. She's in my sidebar, and if you've never visited her, wow -- you are in for a treat. One of Mrs. B's daughter's school teachers said, in front of the kid's whole class, "Pagan holy days are an oxymoron." So far Mrs. B has been unable to wrench a true apology from the teacher in question. Said teacher is only "sorry [insert the name of your child here ... and I mean your child] got her feelings hurt." That's a damn far cry from "I'm sorry I said something so disrespectful about your faith." I have a little bumper sticker of the First Amendment on the side of my car. I look at it every morning before I come into school. I have students who are Jehovah's Witnesses and students who openly wear devil-worship garb. And everything in between. For me to make any comment whatsoever about their faith would be out of the question. I am a government employee, and the government does not legislate religion. So far. Let's keep our fingers crossed. Thank goodness I had a few years of substitute teaching before I got hired full time. In my early school days I talked about faeries and such -- a little too much. Luckily, the students who heard it were seniors who graduated and moved on. Now I work with freshmen and sophomores, and they could not pull a word about religion from my lips if they reached the whole way down my throat. This is not to say that I don't mention the Bible, and pastors, and all of that from time to time. The Bible and Christian churches are part of my students' valuable prior knowledge (see post below). I offer no opinion, but referring occasionally to the Bible as a piece of literature, or even history (although just about everything in it is fiction) can be helpful to kids looking for something to write about. Offer an opinion, though? This would be absolutely out of the question. When you are a public employee, you have to be absolutely, positively neutral about religion. I even watch that I don't make snarky asides, or even double entendres that my student population wouldn't understand. But wait: There's more, Billy Mays! In these days, a teacher needs to be careful about touching a student, even a cheery pat on the back. No terms of endearment, either. Not even neutral ones, like "kiddo" or "my dear." For awhile I was calling my students lieblings, but I've even stopped that. It saddens me that I must address my students as "students" or "ladies and gentlemen," but it is what it is. Best to err on the side of caution. Can you imagine how difficult it is for a person who has a daughter just about the age of her students, to watch those students file into the class each morning, and not even give them a quick, maternal pat on the shoulder? Or to look over someone's paper who has worked really, really hard, and not pat them on the back? Can't be too familiar. A very tough challenge for a born mom like me. Mrs. B's daughter has had her First Amendment rights abridged by a government employee. And apparently a stubborn one too. I would even call into question the discussion that predicated the remark. Teaching is a mine field. The First Amendment is a road map through it. Teachers, read it. Every day. Isn't it funny how, when you start to pick at a pesky scab, it comes off and real blood flows? Today I've been thinking about Hunger Games, since I suppose some throng of ritual-murder re-enactors is going to descend on movie houses tonight. Today, while busting my brains teaching, another thought occurred to me. There's a huge disconnect in this imaginary society between the technology in the Capitol and the process of energy extraction in "District 12," i.e., Appalachia. When you think about how dystopian our treatment of the Appalachian Mountains is today, with mountaintop removal mining (MTR) and hydraulic fracturing (fracking), and when you think how few jobs these so-called "industries" actually produce over the long haul, why would there even be a District 12 to begin with? A concentration of technology in the hands of a few heartless individuals would surely leave Appalachia looking like a moonscape even in the here and now. The technology on display in this novel begs the philosophical question of why mining techniques would be so primitive, allowing for a populace large enough to rebel. And fences that can be crawled under in the same world with camera implants? Why wouldn't every child be implanted with a camera? There wouldn't be as many to take the implants if the future society used MTR and fracking for its power. Now, I betcha the AppalLit folks will pick this one up! Imagining a dystopian future is extremely difficult. Look at that old war horse The Road Warrior. All these bad guys driving around the Australian desert in their modified vehicles. Where does the gas come from that the bad guys are using? They're trying to get someone else's, but they don't seem to need it much. Nor do they have a supply depot. Doesn't look like there's much water in that landscape either. Big leap of faith, folks. Big leap of faith. Imagine for a moment that the world nearly came to an end, and 90 percent of the human race was wiped clean off the face of the Earth. Suddenly there would be 1,000 people in Snobville, 300,000 or less in the whole Philadelphia metropolitan area. What do you think? Would we see cooperation, or competition? Would every person have value? More value than now? Maybe what we really need is a cataclysm. Perhaps it would lead to a brighter future. This post brought to you by the gal whose novel was deemed a suitable table covering for a particularly greasy fish fry. Enjoy the show! Well, everyone's weighing in on The Hunger Games, and since I hadn't heard a thing about it until a few weeks ago, I girded my loins and ventured into Barnes & Noble for a copy of Volume 1. This was an intensely dismaying book for me. Dystopian fiction always bothers me (I couldn't even read 1984 the whole way through; it was too unnerving). This one bothered me too, because some teenagers growing up on this sort of fare will find it appealing for re-enactment -- not a good thing by any stretch. Last night I was reading some comments from Appalachian bloggers about the book, since the heroine is clearly, explicitly, from a region that was at least once called Appalachia. As a protagonist she fulfills most of the stereotypes of "good" Appalachians, in that she can fend for herself off the woodlands, she's athletic, smart, compassionate, and a good shot with bow and arrow. The bored deities are satisfied with her self-sacrifice and underdog status. It's not this part of the story that riled me. The part that riled me was the depiction of the society as a whole. There is a strong tendency in literature to paint the future in the grim grays of failure. Truth is, the human race is an up-and-down species. The excesses of Ancient Rome became so vile to its citizenry and its nearby neighbors that it was overthrown by invasion and religion. As far as I'm concerned, the Nazis and their Holocaust, and America and its atom bomb, represented a new low in human affairs from which we have rebounded. Will we descend into Nazi hell again? Of course! Will other human beings resist that? Of course! It's never so easy as novels make it look. And Hunger Games went a bit too far. I simply cannot fathom a country where the entertainment consists of a yearly pageant of teenagers slaughtering each other. There are twelve Districts in the book. A Thirteenth was destroyed because it resisted. So, when the Thirteenth got its back up, what did the others do? If the only colony that had rebelled against England was Massachusetts, we'd all be God Saving the Queen. But Massachusetts called on the other colonies, and together this bunch of poorly-fed, poorly-armed, non-soldiers faced down the best military might of the era. Does anyone remember why the Americans won the war? Heck, they lost almost every pitched battle. They won because France provided soldiers, guns, money, and a navy. France. "Lafayette, we are here." As I was reading Hunger Games, I found myself asking, "Where's Lafayette? Where are the Chinese?" Oh yes, and even, "Where's Che?" although the author sort of indicates that Che's type of army would be no match. I'm predicting that this trilogy will end with a destruction of this evil dystopia from within. It would make more sense if Air France came to the rescue. But what do I know? I couldn't get a publisher for my book, and this author is raking it in. Call me sour grapes if you will. Guilty as charged. Stomp me into wine. Welcome to "The Gods Are Bored," snickering behind our hands since ... forever! If you can't laugh at the world, you're screwed. Now, I don't mean laugh at everything. Just the funny stuff. If your life seems short on funny stuff, force yourself to search it out. Pray to Loki, Anansi, or Coyote. That ought to do the trickster. Ever since there have been standardized tests, there have been mandates to teach to those tests. Curriculum is built around "passing the test." Here in New Jersey, this means a lot of answering open-ended questions and a lot of writing the same kinds of essays over and over again. Of course the students catch on. They did the same thing last year! Why do it again? Good freakin question. The answer, of course, is that it's "on the test." The students know this. So they begrudgingly pull their loose leaf from their binders and dig into yet another explanatory essay. The latest test wrinkle here in Chris Christieville is an essay that explains a quote, an adage, or a common emotion, such as the need to overcome fear. It's this quote/adage thingy I'm teaching right now to 110 students from Camden. You know how it goes. Sometimes you get a class full of respectful, studious kids. And sometimes you pull a classful of smart-alecks. This happens to teachers everywhere, and if you're not a teacher, then you were a student -- which were you, the nerd or the smarty? Today my smart-aleck class comes up with the Big Question: "Why are we always practicing this test stuff?" Not to pat myself on the back or anything, but I can usually finesse these questions. "Well," says I, "all you're doing in this essay is explaining something. And you do this all the time with your friends. They might say, 'What do you mean?" and you'll tell them what you mean, and then maybe follow it up with a little story about someone who did the thing they can't undersand.'" Anne: "You know where you hear this kind of essay all the time? At church. I don't know how many of you go to church, but next time you're there, listen to how the preacher structures his sermon. First he'll give you the Bible verse. Then he'll tell you stories that illustrate it. Then he'll end with a call for you to be more like the Bible verse. That's just what we're doing with this essay. So I'm not only preparing you to take the standardized test, I'm preparing you to be a minister." Only one kid in 25 said, "I don't believe in God." The rest of them tucked into their essays, no doubt dreaming of glory days ahead in which a sea of pious faces will turn their way to hear their wisdom. Hey. In this job you do what you gotta do to keep those Number Two pencils moving across the paper. However, if anyone ever comes up to me and says, "Mrs. Johnson! I became a minister because of what I learned in your English class!" I am going to binge on the Coffee Cake Muffins from Dunkin Donuts ... I just read that those puppies have as much fat as a brace of Big Macs. Another day in the classroom, another pathetic attempt to wrench meaning from test prep. Coyote, take me away! One of the favorite things I do with my daughters is go to the Philaelphia Zoo. We go at least once a year, and sometimes more. It's even sweeter now that they have two turkey vultures that can't be released into the wild. Our favorite zoo exhibit, by far, is the pygmy marmosets. Full grown they are about the size of baby bunnies. And yet, the eyes that stare back at you through the glass are so doggone human. Or perhaps I should say that our human eyes are so doggone marmoset. Yes, I like that second one better. Whenever the daughters and I have a favorite activity, I always attach an anticipatory line to it. When we go to the thrift store, I always say, "Life is short." It used to be, "Life is short. Let's thrift." Now all I have to say is the first part, and they grab their second-hand coats in a jiffy. My anticipatory line for the zoo is, "When I say pygmy, you say..."
If daughters answer, "Marmoset," off we go to the zoo! Philosophically I don't particularly like zoos, but if you consider their role in keeping certain species viable in the wild, I suppose they're a necessary evil. One of the nice things about the pygmy marmosets is that, being small and social, they seem to enjoy being at the zoo. Three hots and a cot for them! The breeding program is very successful. So, below, is a little ditty my daughter The Spare discovered on the Tube. We all howler monkeyed over it ... hope it's not an inside joke. Have a good day. Treat a bored deity to an offering. Something tasteful, like a well-upholstered settee. Welcome to "The Gods Are Bored," now with 1730 + posts and 165 followers! All followers are cordially invited to the "Gods Are Bored" picnic, June 23 at Cooper River Park in Pennsauken, NJ. Hopefully some big family will be having a reunion that day, and we can crash it for leftovers and listen to the DJ. RSVP by comment thread. I thought we had left behind the notion that American women should be breeding machines, but apparently I was wrong. Recent legislation requiring ultrasounds, recent comments by an opiate-addled radio blabbermouth, and recent panels consisting of only men leave me wondering -- what is the future direction of human rights in this nation? This requirement for an ultrasound prior to an abortion is not only courting fiscal disaster in the very states where it is being enacted, it's also a terrific insult to women, right out of the gate. The implication is that if you see a little heart beating inside you, no matter what your circumstances, your little motherly heart is just going to melt and go gooey, and you'll call the whole abortion off. Yes, that might happen sometimes to certain morons of the gender. But that tiny heartbeat grows into a raging ball of need that can sink you like a stone, even when the child grows to adulthood. Maybe you thought of that when you scheduled the procedure in the first place. And what do you do with your life, with this child's life, after the jelly dries and the probe gets sanitized for its next victim? Well, it depends on the circumstances, I guess. This much I do know. Unwanted children usually grow up without at least one parent, and maybe without both. Often they are abused, neglected, bullied, or ignored. Who picks up the tab when they are sick? The very state that wanted them while they were little blips on an ultrasound screen, but sure doesn't want to see them in the emergency room with lacerations or multiple broken bones. We have huge and debilitating social issues in America just now. You don't have to be a conspiracy theorist to see how this whole abortion thing acts as a tool to distract attention from what is really wrong. Which is the fact that a very small group of citizens is cashing in on the backs of the rest of us. I have an idea. Unwanted kid? Send the bills for upkeep to the one percent. All this jelly and probing will cease promptly. Here's another "Gods Are Bored" theory. There's a push-back against abortion because we have forgotten the days of yore when unwanted babies were carried to term and then quietly murdered and buried, or left in boxes at the gates of orphanages, or just dumped in a ditch. That used to happen. It happened a lot. Throughout history. Don't trust me on this, ask a bored deity. They all remember the days when the only kind of jelly was something you pulled from a beehive. What a boring topic! You can stop right here, and I won't even bat an eyelid. Except that this is "The Gods Are Bored," and we like to poke stupid things with sharp objects. Education in America is quickly becoming "one size fits all," and the sizing is coming from a new national curriculum. The new curriculum for Language Arts (aka English) includes reading history texts like the Gettysburg Address. But this national standard stuff goes farther. It aims to use Language Arts class to analyze historical documents over the entire period of American history ... or, at least up to the Civil Rights Era. Someone, somewhere concluded that since people don't read novels in their jobs, they shouldn't waste time reading them in school. And forget poetry. Poetry? Ha! A Shakespeare play here or there should do it. More important to read "seminal historical documents, e.g. George Washington's Farewell Address." Okay, so I just tried to read Georgie's farewell address, and it was duller than the dirtiest dirt on the bottom of a honeydipper's boot. Calling it boring just doesn't suffice. I love to read, and I couldn't get past Page 1. Heck, Page 1 and Paragraph 1 are pretty much one and the same, and I couldn't finish either. This same national curriculum lists Little Women as a "recommended" novel. If you have time to read a novel, that is. Gotta cover those seminal American documents! The good news is that when the administrators come to evaluate me, they won't have to look for "student engagement," because I'll be so bored that I'll be the one with my head down, asleep in class. News flash: I will never teach George Washington's Farewell Address. And I would rather be hoisted on my own petard (whatever that means) than teach Little Women. Boredom between bookends! The road to Hell is paved with good intentions. I'd say America's students just got a thick new shot of asphalt. Buzzard Central, as usual today! Over the weekend, my dear fellow bloggess Yellow Dog Granny alerted me to a live feed from the San Diego Zoo. One day before my birthday, a new baby California condor chick hatched in a nesting cavity at the zoo's "condorminium." Each day, during daylight hours in San Diego, the camera is recording the condor parents as they care for their newborn. Depending upon how long the zoo leaves the baby with the parents (ideally it won't be removed until it can remove itself), this live stream will become more and more ... well ... lively. What's most touching to me is that the father of this chick, Sisquoc, was the father of the first captive-bred condor chick ever born at the San Diego Zoo. I had the pleasure and privilege of seeing Sisquoc (from a distance) when I went to write a newspaper story about the condor restoration program back in 1983. I suppose Sisquoc has done him some breeding over the past 29 years. He seems to be quite the doting father. If you watch the stream, Sisquoc, the dad, is the condor with the tag. The mom doesn't have a tag. They work in shifts, and right now the best chance of seeing the hatchling is when they switch duties. Eventually the baby will grow and be more visible. I was watching when the chick hatched. Visit the Condor Cam frequently and at length. Point it out to any of the people above. Meditate on the parenting you see and on the slender recovery of this magnificent vulture species. And ask yourself: What is so special about the human race? Welcome to "The Gods Are Bored," voracious voluptuous vulture-viewing since 1974! If you find vultures offensive, you are on the wrong website. Go to the canary page, if that's how you roll. Where I live, the seasons change. The Earth goes through a great Wheel, year after year. This time we had no winter, but all the same, the spring flowers are coming out, and they are a welcome splash of color on the drab landscape. I like to think of life as circular, like a farmer looks at growing seasons and harvest seasons and planning seasons. However, there's at least one day a year when that circularity becomes challenged: on one's birthday. We celebrate the anniversary of our births in this culture. It's a big deal. Awhile back, I went to a big party for Mr. J's grandmother when she turned 90. Still eating cake and opening gifts at age 90! There's a whole industry that thrives almost completely on birthdays. Little kids love birthday parties, both their own and others'. My daughter The Spare has engineered some whoppers over the past decade, and her efforts were rewarded with a splendid Sweet Sixteen that cost us next to nothing. Spare will be 18 next month, and already her affection for birthdays is lagging. No bigI plans this time. She's just keen to get a voter registration application. Another blue voter for the ages! I'm not keen for birthdays at all. Today is mine. I've had many. I don't like tacking a higher number to my age. I don't like being reminded that I'm mortal ... well, not exactly that I'm mortal, but that the challenges of old age are inching ever closer. I'm a pretty youthful fifty-something, but I've got a titanium hip that has a clock of its own. Nothing about me is as energetic as it used to be. Well, with age comes wisdom. At least that is true. No one is ever too old to learn something or to be challenged by novelty. Just take this blog, for instance. When my only way to write was a pen and paper, I couldn't keep a diary to save my life. Now, "The Gods Are Bored" is almost to its 7th birthday! You know the other thing about birthdays? When you've had 50 or more, they aren't very special anymore. There's laundry and housework to be done. Cat chores. I don't mean to sound so blue. Actually I am starting a whole new course of study today. And it could be worse. Thanks to a Yahoo article, I calculated the ages of my felines. Alpha is 84, and Beta is 68. Time is a line for them, too. My dear friend Yellowdog Granny sent me this link as an early birthday present. Looks like my day is complete, I need not stir from my chair. Is reform needed? is it through you? you need to accomplish it. --Walt Whitman, "To a Pupil"
Well, it's a doggone good thing Walt Whitman is safe in the Summerlands, reading his poetry to the Gentry. No one was quite so giddy about the bustle of America, its workers and its thinkers, as Walt Whitman. He was a defender of democracy, even when it led to a civil war. Even after that war, he could still see fit to re-publish this poem, which was written prior to the conflict. Today, some reforms are in dire need of Personalities to accomplish them. It seems like all the Personality lies with moron blowhards like Rush Limbaugh. The "reforms" are enacted not through Personality, but through committee, through political donation, through backroom deals, through public inertia. I emphasize the latter. Voter turnout was abysmally low in New Jersey's last gubernatorial election. Just look what that wrought. The Chris Christie menace, elected by the lowest voter turnout ever when the governor's mansion was the prize. Where are the Personalities we need? Who is standing up for the workers? Who is guarding the land? I would love to see the Occupy movement survey its most dynamic members and choose a few to give old-fashioned speeches. Not bytes for Olbermann or CNN. Real speeches. Not canned political nonsense spewed from a teleprompter, penned by a hired hack. Real words. Stuff from the heart, not the pocketbook. Mr. J says that if politics stays as it is now, we will truly have class warfare, because the one percent will corner so much that the rest of us will literally begin to starve. Before that happens, could someone please speak up? Isn't there anyone with Personality? If things are still like this four years from now, I'm going to pat my daughter The Spare on the head and send her out there to accomplish some reform. She has abundant Personality, and she cares about the land. Of course, she could be killed for her passion. Ain't that America? There's nothing like a good Vulture Festival to perk one up. I was so blue in the previous months that I had no enthusiasm for the event, to the point where I almost forgot to order the costume. Ahhhhh. Feathers restored. All's well in the roost. Wherever it may be. When my dad was in college at the University of Maryland (G.I. Bill, Class of 1948), he took an entomology course. No doubt he was inspired by my grandfather, who also took one (Shippensburg Normal School, 1923). Prior to beginning the entomology course, Dad got a note from the professor. This was in the spring, for a class beginning in the fall. His assignment was to collect and mount a few insect specimens from where he lived and bring them to class the first day of school. Well, Dad lived in the Appalachian mountains. It was sort of like letting a hungry kid loose at the candy kiosk in the mall. With very little effort, he filled two 18 X 18 boxes with the local six-legged buzzers, clickers, biters, chewers, and fliers. He had the Dobson fly in every stage of its existence, all chronologically in one corner of one box. He had a Luna moth the size of your hand and the minty-green color of a J Jill t-shirt. The professor wanted to keep Dad's collections, but he wouldn't let her have them. Dad was very protective of his insect collections when he was alive. Even though insects are tough and skeletal, they're also delicate if one bustles them about. However, as Dad got older, he got a little more adventurous. In his last visit to my house in Snobville, he brought both boxes and showed them to Heir's kindergarten class. When he died, I brought the insect collections to Snobville for good. My motto is "production for use" (which is why I don't own a firearm). Several times I have brought Dad's bugs with me to school to show my students. Mind you, I teach English. It just happens that there are several stories about insects in the English textbook. Have you ever noticed this phenomenon? Every time I open those insect boxes, it's as if I'm immediately transformed back into my childhood, looking at them for the first time. Since I don't open the boxes very often, the novelty has never worn off. I still go "AhhhhhhAAAHHHHHH." So do my daughters. Well, there's no denying it. The insect collections are starting to show their age (which is in excess of 60 years, after all). The Luna moth is gone, replaced with a newer Monarch butterfly. There are a few basement crickets from Snobville that he added way after the fact for his granddaughters. Still, with the lugging to and from school, and the tendency for viewers to want to touch, legs are starting to slide across the interior, antennaes are bent or gone, some pins have become unmoored. What am I going to do, sit the closed boxes on a shelf and say, "Don't ever touch those?" Forget it! People wear their diamond rings! Bugs on display, whether or not they can withstand the onslaught. At the end of his life, Dad expressed regret about collecting insects. He felt bad that he had killed them (chloroform in a box or pill bottle). This, to me, shows his drift toward Druidry. He began to consider the fact that he had violated Nature for no good reason. This is why his collection will stand with no further additions. "Live and let live," is what I say -- even to that pesky yellow wasp that stung me five times after it had the bad judgment to crawl up the inside of my pants leg. Seems like most people must take the "live and let live" philosophy these days, because insect collecting pins are themselves collectible. You can't find them anywhere. Not that I'm looking. Maybe you have a big box of them at home. If you do, hang on to them ... bugless and benign. The Dobson flies will thank you. Taking Dad's bugs home from school now. See you soon. I have to laugh at Facebook and its Timeline. We Druids see life as circular, not linear. My daughters are grown, my husband and I enjoy looking at each other, and therefore life goes round and round and round. Hopefully for awhile. The first weekend in March is always the East Coast Buzzard Festival, at which I serve as Shaman. I am winning young hearts and minds for the worship of the Sacred Thunderbird. What a noble calling! 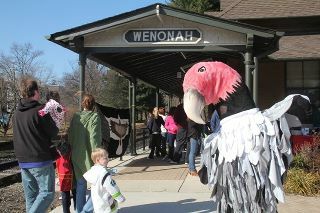 Here is the fabulous photo of me bearing witness to the children of Wenonah in my Shamanic attire. Please don't try to take my place! I love this day, this activity, and the bird that I hereby portray. *I finally got to hear and dance to the buzzard songs written for the festival by Jim Six. Sometimes in the past, Jim has performed inside the building. It was good to see him unplugged, with just the acoustic guitar. *Some delightful little tot roared with laughter as he tried to feed me popcorn and I shoved it against my beak. Could have been a YouTube viral if someone had been recording it. Funniest part was, the tot was so young that he had never had popcorn before himself. Once he tasted it, he stopped feeding it to me and started eating it himself. *A teenager gave me a buzzard paper airplane he had crafted at the craft table. Destined for my altar. *A little girl hugged me and said, "I love vultures. I will always love vultures! They aren't ugly and scary, they're really nice!" And so the buzzard worship flock grows, cute little tot by cute little tot! *This year the Wenonah Elementary School Band played in all its ten-member glory. Actually the kids were pretty good for beginners! I've heard a lot worse. Once the music teacher noticed that the big buzzard mascot had rhythm, the big buzzard got offered the honor of conducting the final number! It was classic. I'm such a ham. I felt like Snoopy doing "Long Road to Tipperary." Unfortunately, the buzzards who inspired this annual festival have seemingly moved on to a more rural roost, about three miles away. Last year buzzards were everywhere ... I mean, over 100 kettling in the sky at the end of the day. This year I saw two lonely wretches on the water tower ... that was it. Oh well, I think the Vulture Fest is here to stay. Time after time, the kids would say, "See you next year, Buzzy!" When the wheel comes around to this time again, I hope it will find me at the Buzzard Festival. So might it be, so might it be, so might it beeeeeee. A long, long time ago, when "The Gods Are Bored" was very, very young, I wrote a post about the existence of fairies. I suggested that some fairies could be accounted for by legends of "little people" who lived on the edges of civilization. Skeletons of diminutive humans have been found on islands and such. In my unproven-yet-credible opinion, Great Britain probably had a race of "little people" somewhere in its forests. "Little people" are not the same thing as fairies. Fairies exist in another realm, a dimension that we can see only with the sixth sense. If your psychic powers are heightened, or if you are very open to the notion that there are fields and plains that humans aren't programmed to see (at this time in evolution), you will experience faerie. Some children have a heightened psychic sense, to such an extent that it makes me believe in reincarnation. I myself had out-of-body experiences when I was young. And I saw fairies. The fairies I saw didn't even look human. They looked like a combination of dog and deer, with frontal eyes, pointy ears, and bristly fur. Their teeth were like deer teeth and their heads were shaped like deer heads. They were the size of full-grown humans, but they could make themselves smaller if they wanted to. Now, you can call me an imaginative youngster if you like, but when I opened The Notebooks of Brian Froud (you can get it from Amazon), I found the very creature I had played with when I was a kid, right there drawn by Brian in the book! I knew immediately that I was looking at a portrait of my fairy friend. Again, let me say that not all fairies have human forms. Some look like creatures. It's a whole world out there, my friends. We just can't see it. My father met my husband's grandmother one time. I assure you that they did not talk about fairies. And yet both of them, on their deathbeds, described red-headed "children" standing in the doorway and beckoning to them. In my father's case, he identified the being as "Peter Pan." In Grandma-in-law's case, she saw a red-headed little girl who asked her to "come along." She said she wasn't ready. Within a week she died. As we step off this plain and onto another, the fairies become more clear to us. You don't necessarily have to be dying, but if you're not dying you have to be open to all possibilities. Fairies can be scary. Proceed with caution. To those of you reading the May 5, 2005 post and asking me to help you find fairies, all I can say is, try to remember your deepest childhood to see if you have some memory of them already. If so, concentrate on that memory. If not, spend some time in the most cluttered room in your house, telling jokes and riddles. This is what They like. Oh yes, the woods are fine and dandy, but you don't have to sit by a stream. The fairies are amongst us. They are in us, in our memories and in the sections of our brains that we don't use yet. To those of you reading the May 5, 2005 post and asking me what I'm smoking and where you can get some ... nothing, and I have no idea. Bite me. To those of you who believe in God and not fairies, how the heck do you explain those seraphim? Just asking.